When you think of vitamin C, you probably think of oranges and orange juice. That’s because the brilliant-colored fruits and the juice squeezed from them are packed with the stuff. Sadly, though, it turns out orange juice contains more than just vitamin C. Glyphosate, the toxic pesticide, is rearing its ugly head yet again only months after the nasty stuff was found in cereals. A new study found glyphosate in several brands of orange juice. 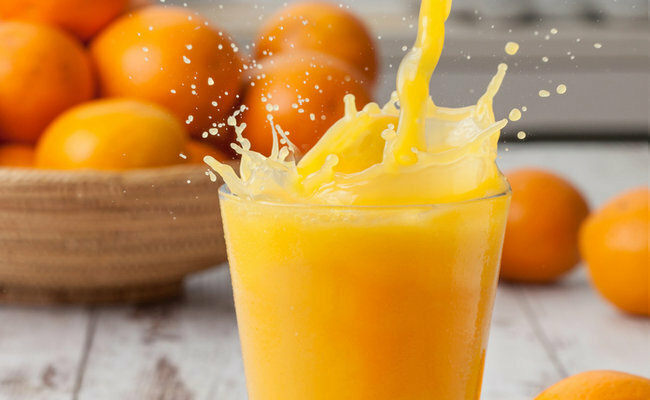 Moms Across America conducted a test of 6 brands of orange juice only to discover that all 6 brands tested high for glyphosate. They include: Florida’s Natural orange juice, Tropicana, Minute Maid, Starter Bros, Signature Farms and Kirkland. The products ranged from 2.99 parts per billion (ppb) to 17.16 ppb. Tropicana had the highest levels at 17.16 while Florida’s Natural had the second highest levels of glyphosate of all the orange juice brands tested, having levels 3 times higher than a year earlier. The WHO’s International Agency for Research of Cancer reviewed approximately 1000 studies before concluding that glyphosate is a probable carcinogen. Glyphosate-based pesticides are the most widely-used pesticides sold and used globally, with Monsanto’s RoundUp being the most common one. It is used on many food crops, including genetically-modified organisms (GMOs). Additionally, glyphosate-based pesticides are sprayed on parks, roadsides, gardens, railway tracks, playgrounds, golf courses and cemeteries. While Monsanto continues to declare its safety, glyphosate has been linked to a wide range of health problems, including lymphatic cancer, which has been the subject of numerous lawsuits. The company’s product, RoundUp, was recently the subject of a landmark lawsuit, resulting in $289 Million in losses for Bayer AG, the Germany-based company that acquired Monsanto. The Food and Drug Administration (FDA’s) maximum allowable amount of glyphosate in a food product is 5.0 ppm. This is extremely high given the fact that no amount of glyphosate has ever been deemed acceptable for human health by the scientific community and the research continues to pile up on the lack of safety of this chemical. As far as the recent orange juice findings: when orange juice is marketed as a healthy choice or referred to as “natural” within the product name, then the presence of a toxic weed killer needs to be taken seriously, regardless whether the federal agencies responsible for protecting citizens are doing an adequate job. The Environmental Protection Agency (EPA) banned the chemical weed killer over 30 years ago, but then reversed its decision, although the studies used to determine the chemical’s so-called safety were provided by the chemical industry itself and recent evidence uncovered during one of Monsanto’s many lawsuits showed that the studies may have been faked. In another recent study by the Environmental Working Group (EWG), all 28 samples of oat-based cereals tested were found to contain glyphosate. Some of the cereals found to include glyphosate include: Cheerios (multiple flavors), Quaker Oats (multiple flavors), Quaker Granola (multiple flavors) and Quaker snack bars (multiple flavors). It’s evident that the agencies responsible for regulating or banning these toxic pesticides need to step up and ban glyphosate now.